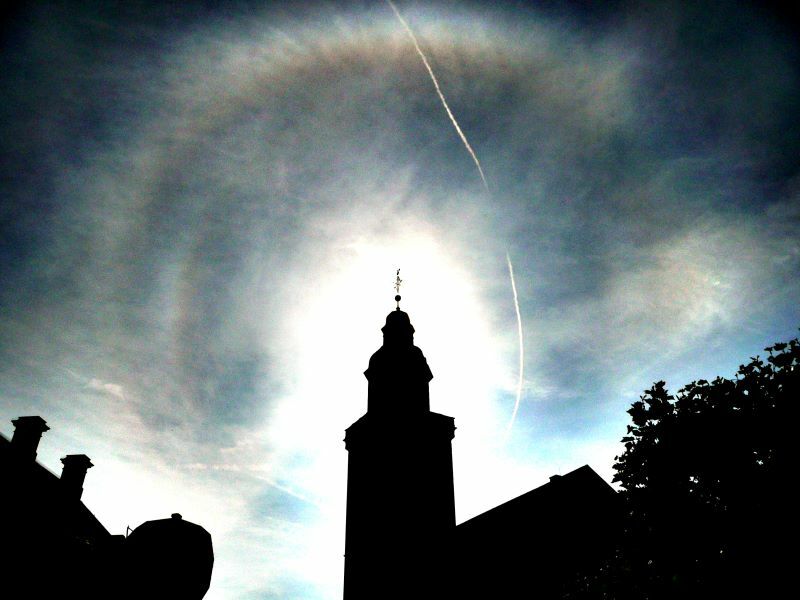 In the afternoon of October 14, I observed a large halo display in Bochum, Germany. 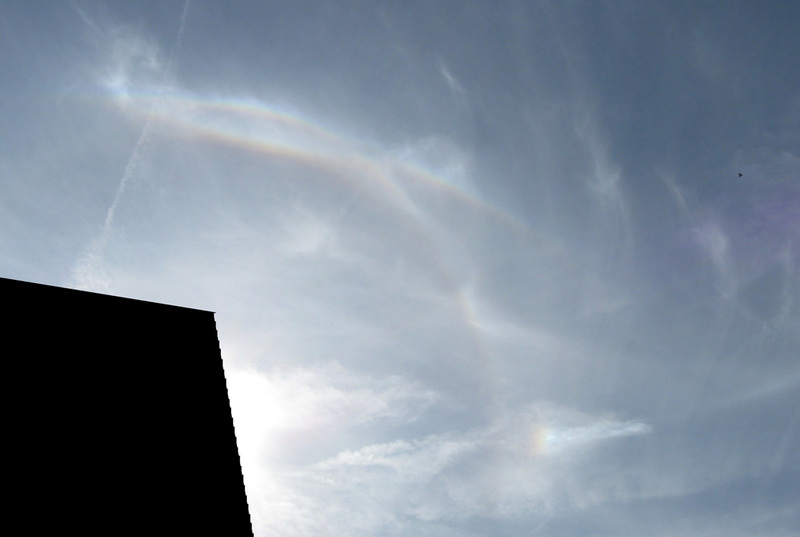 At 14.50 CET, I noticed a conspicuous white arc, forming a circle around the zenith together with the CZA. A closer look showed that this circle was not really circular, but rather had the shape of an American football. 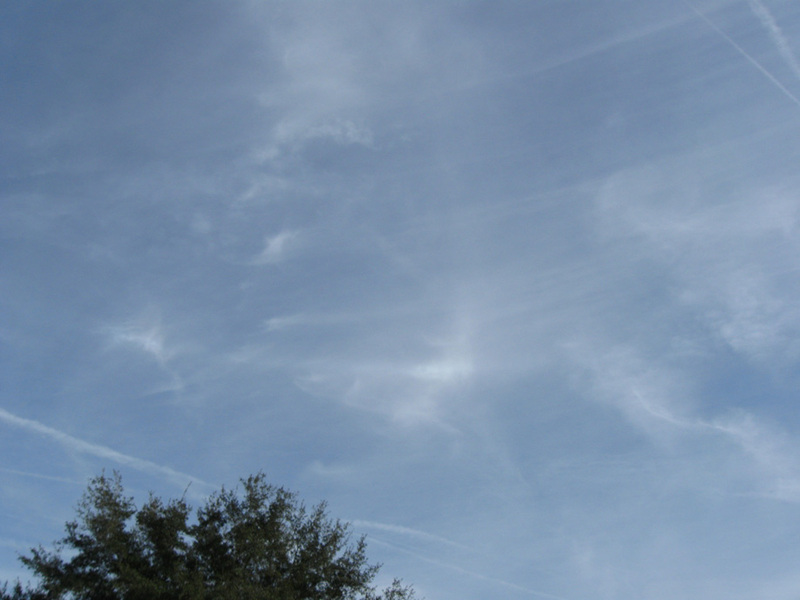 This white arc grew longer and longer, an as ist passed the supralateral arc, it turned out to be the heliac arc, clearly visible in thin cirrus clouds. 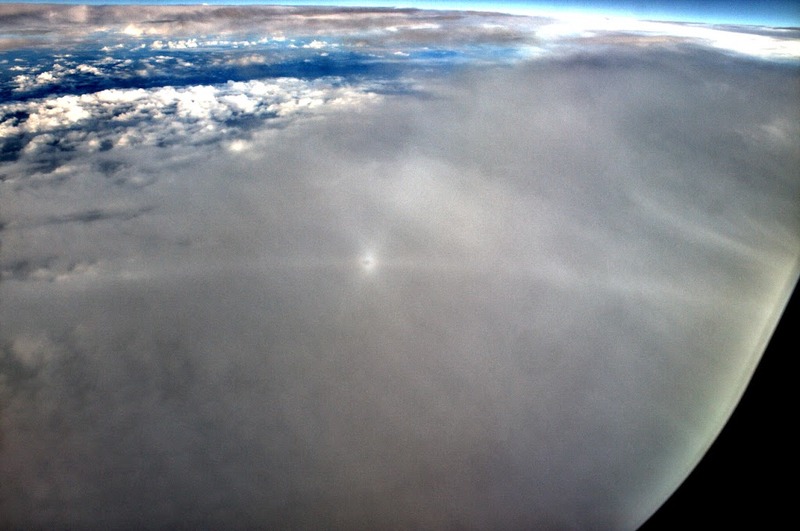 After 15.00 CET, the halo display slowly vanished, but before it faded away, left Lowitz arc was visible for about 10 minutes, as well as a very bright part of the parhelic circle. 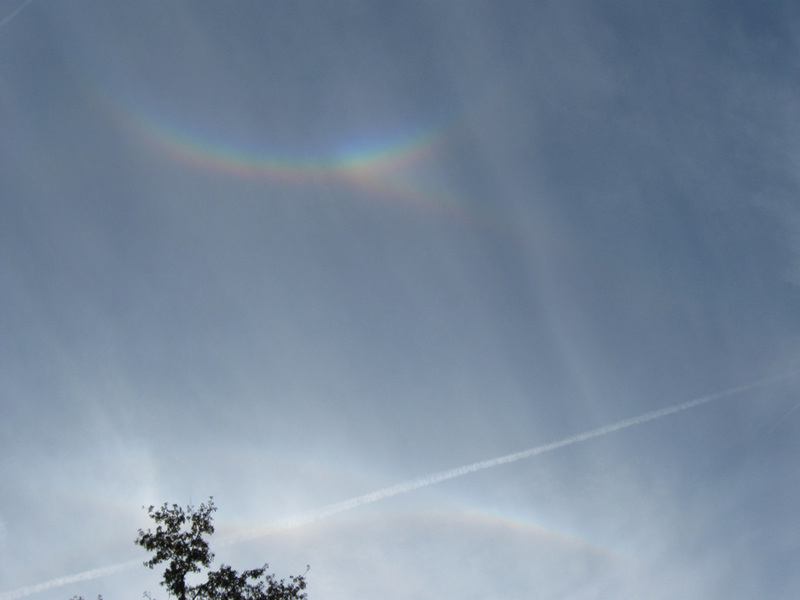 The display ended at 15.25 CET, having showed 10 different types of haloes with up to 8 being visible at the same time. I took these pictures during the beginning of a flight from Paris to Washington DC on the 18th of September. It shows the subanthelic area. At first the subanthelion appeared alone ( 1 ). 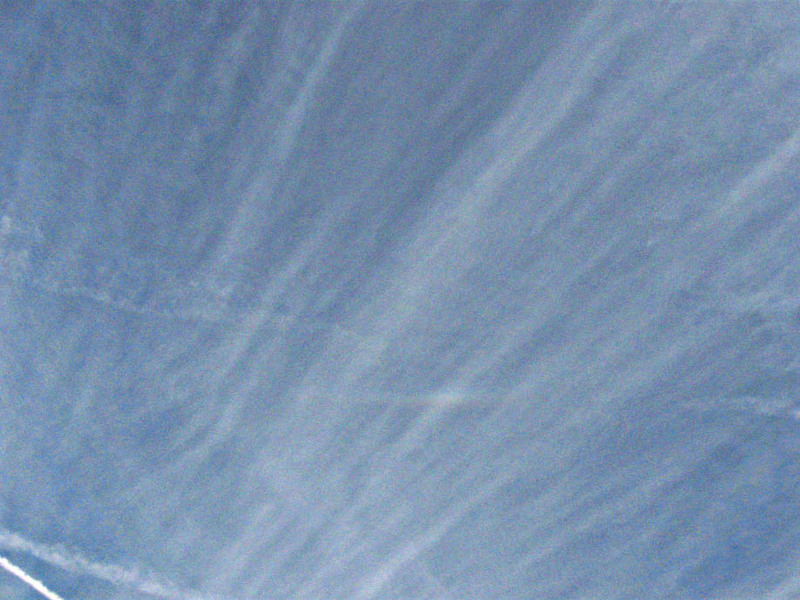 Then a short time later subparhelic circle and diffused arcs appeared too for about 1 minute ( 2 ). 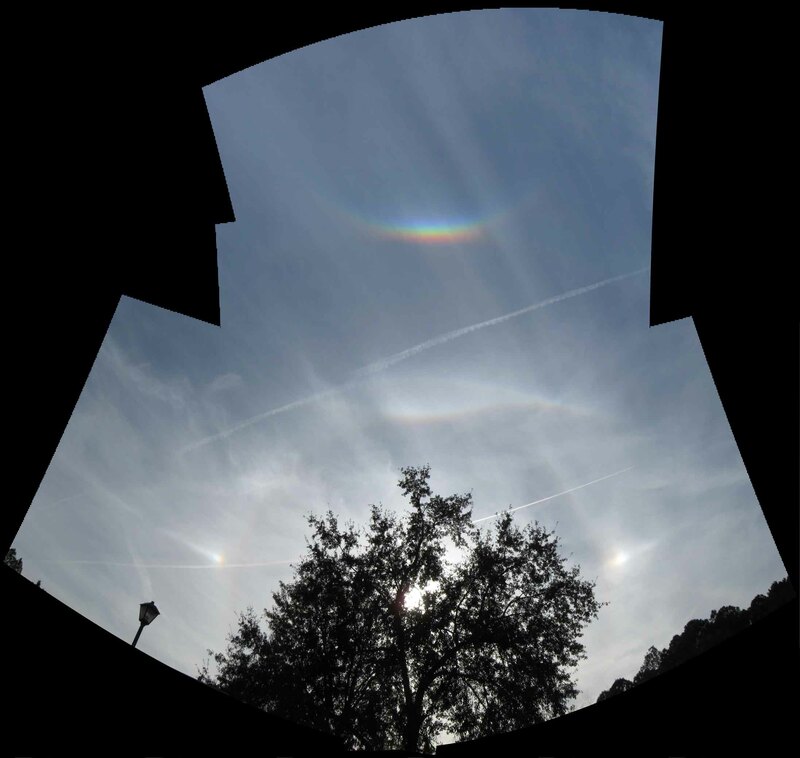 The blog on atmospheric optics has moved to a new address ( 1 ), and has recently been updated with many interesting observations. 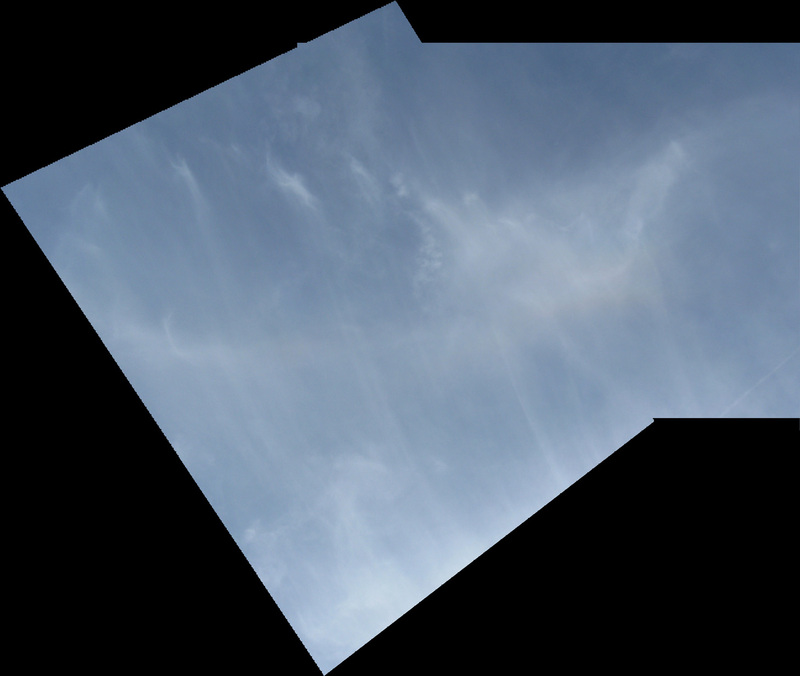 As a teaser, Michael Großmann's image of a tertiary order rainbow can be seen on the right. 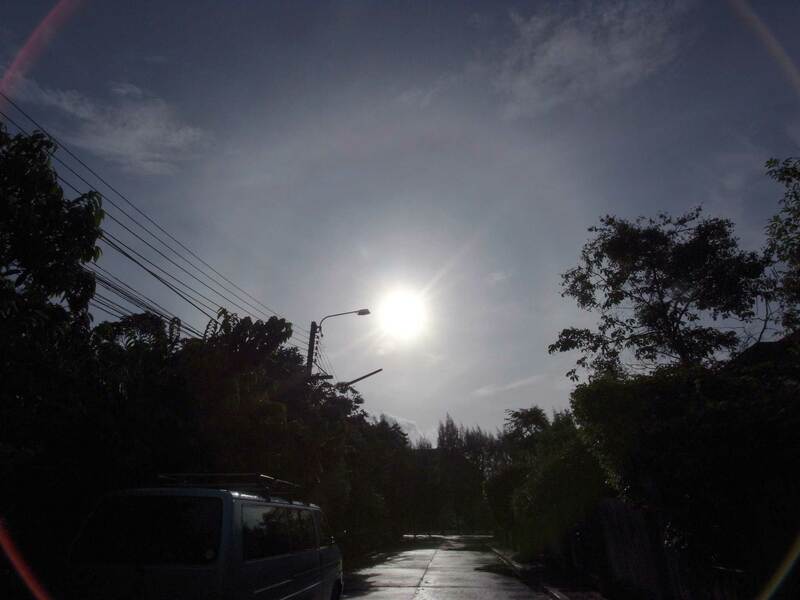 The above image was photographed by Pitan Singhasaneh on 5 June in Bangkok, Thailand. 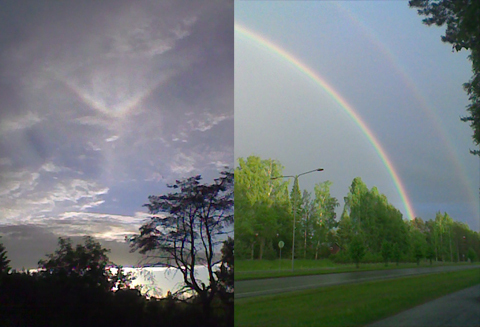 On 4 June 2011 Pietari Puranen observed these rainbows in Jyväskylä. 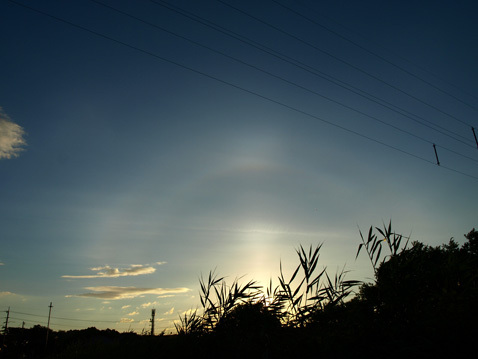 When he turned around to see the sky around the sun, he observed an upper tangent arc. Remarkably, the arc formed in virga precipitating from the same low clouds around the rainbow forming cumulonimbus. 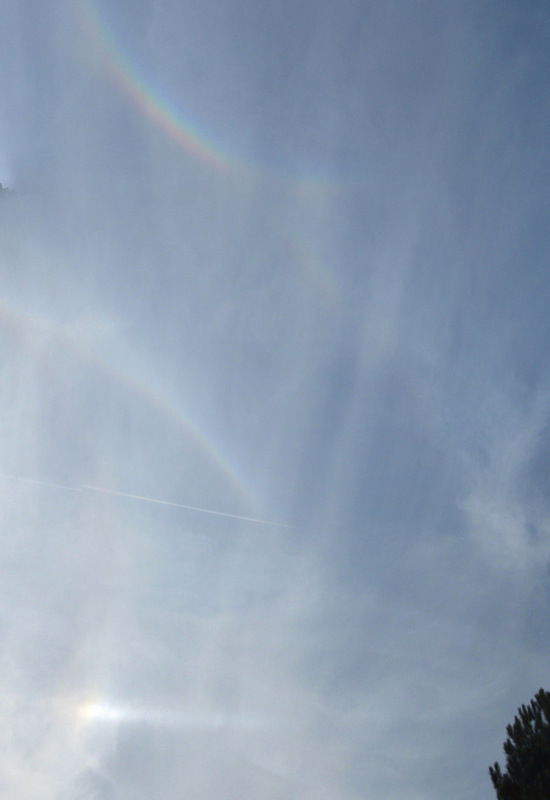 It is rare to see halos in virga so close to rainbows. As column crystals are formed in temperatures relatively close to 0 degrees Celsius we may assume the Virga has been born in temperatures around, say, -4 to -9 degrees Celcius. At least in those temperatures diamond dust close to the ground seems to most often exhibit column crystals. 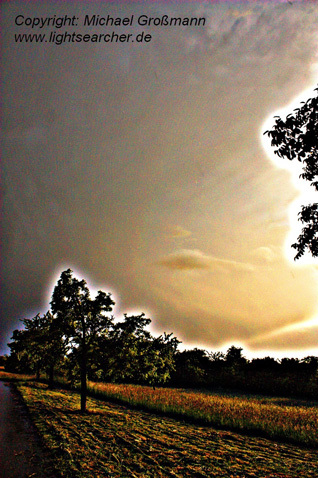 On May 1st 2011 cumulonimbus clouds precipitating hail were commmon. These clouds exhibited clear praecipitatio and later in the evening they featured prominent virga. In these virga a sun pillar formed and as the sun descended behing stratocumulus a double sun effect was seen. 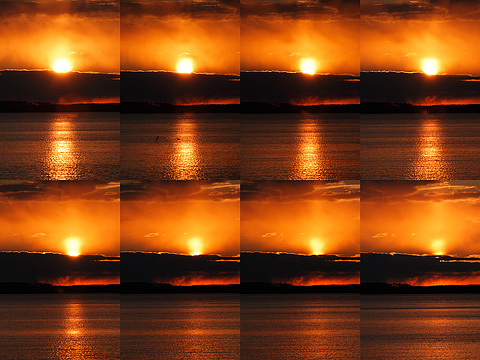 A series of images is provided to see the progression of the effect. The real sun can be seen descending behing the stratocumulus. The first observation of this effect was by Giovanni Cassini in 1693 (see e.g. Riikonen 2011 (1)). By clicking the above image a larger version can be seen. A full image gallery is available online (2). 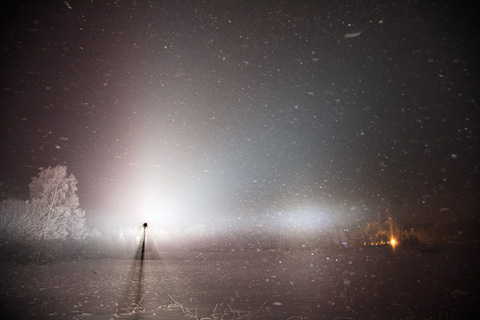 Marko Riikonen also captured images from the other side of the lake (3). 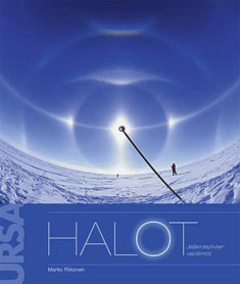 The Finnish Astronomical Association URSA has just published a new book on halos by Marko Riikonen. 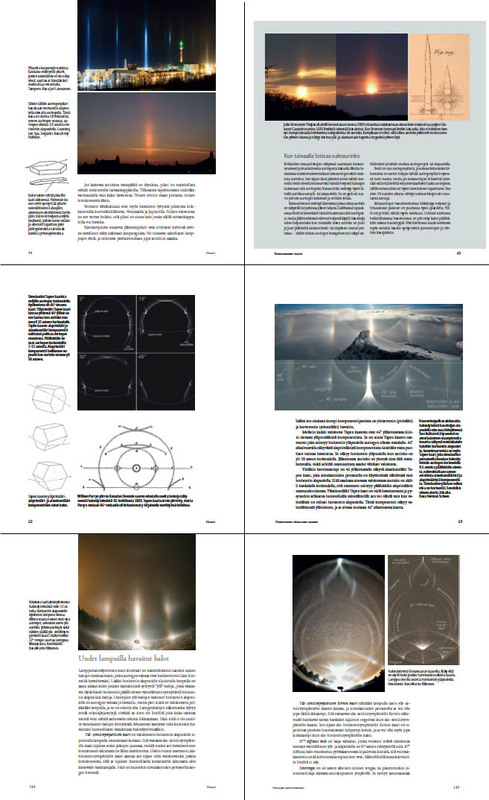 This book combines the latest halo science with stunning images from all around the world. Spanning 168 pages, the book presents, illustrates and analyses all the known (and the less well known!) halo forms in great detail. In addition, the newly made discoveries and methodologies concerning spotlight displays are discussed in depth. Many historical displays are also included as a reference. Particular care has been put into preparing the beautiful computer simulations that are used to explain the ice crystal populations behind each display. The variety of the images is striking and Riikonen has obviously spent a lot of time in finding great examples. Luckily the quality of printing matches these images: I have rarely, if ever, seen a print job this good. 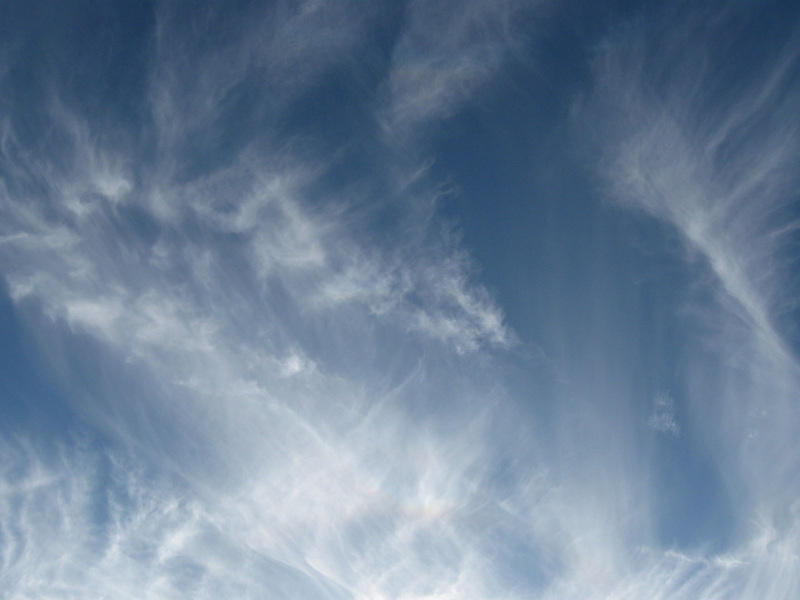 Even the faintest halos can be distinguisted in the images. As Riikonen is a long-time expert in the field, the substance of the book is solid and provides everybody from beginners to experts with new insights about halo science. Being such a significant contribution to the field of atmospheric optics one can but hope for a quick release of an English language edition. A few select pages can be previewed online (1). Publisher information (2). Riikonen, Marko (2011) Halot. Jääkidepilvien valoilmiöt. [Halos. 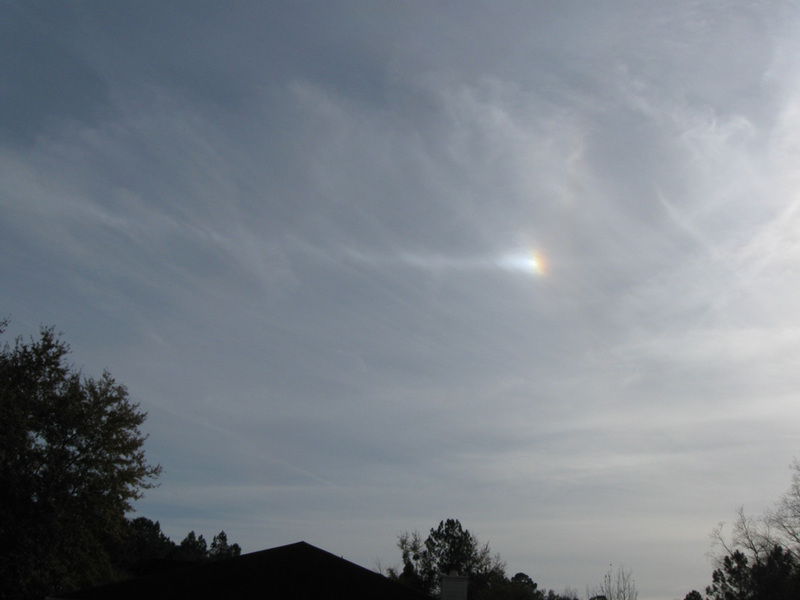 The optical phenomena of ice crystal clouds]. Tähtitieteellinen yhdistys URSA ry, Helsinki. This Liljequist superparhelia was observed in the spotlight beam on 5 January 2011. 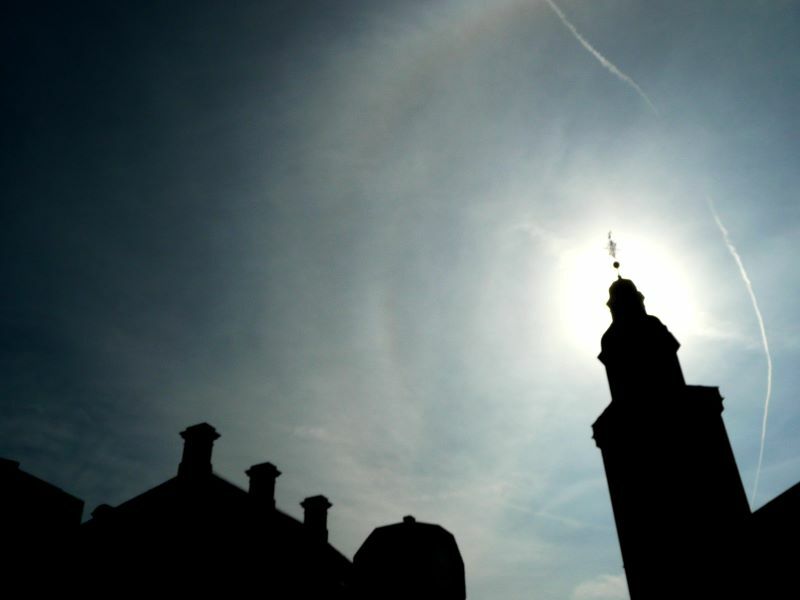 The lamp is about a degree or two below the horizon, thus giving the central stage to the Liljequist superparhelia. The Liljequist parhelia can be seen against the snowy ground below the superparhelia. The halos were seen in diamond dust that was generated by my water ice nucleation agent gun operating ca. 1 kilometer away from the site of the observation. The nucleation agent gun can operate autonomously for hours since the water supply is automated. The temperatures varied between -22 and -27 degrees Celsius. The image above shows some colour artefacts (the background sky is not even color) as we were also testing Riikonen latest HID lamp (Marko Riikonen accompanied me during this night) that has two high intensity discharge bulbs. Unfortunately we were only able to fire up one bulb. Two bulbs would have produced a more even beam in terms of colours and luminosity. Full image gallery is available (1). It also contains a lengthier account on the evening. The nucleation agent gun can be seen in action in a separate photo gallery (2). Before the moon halos appeared, diamond dust was so thick that moon did not shine through and I photographed in spotlight beam. As the the diamond dust started thinning, it also lifted up from the ground - there were not much crystals on the ground. The moon elevation is about 30 degrees judging from the circumzenith arc which is slightly separated from the 46 halo. 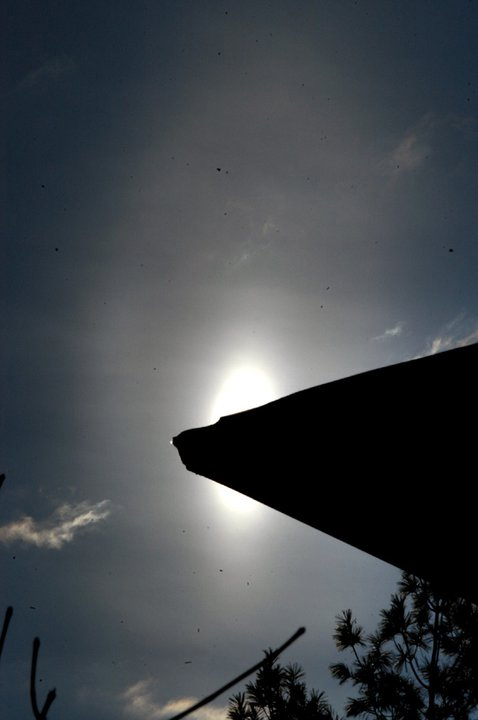 Ari Laine photographed this elliptical halo on 24 February in Lahti. It was already third occurrence within two weeks in Finland. This time the ellipse is more like an elliptical glow rather than well defined ring, but outside the glow above the sun there might be a faint ring visible (one has to be cautious about jpg artefacts). During the last two weeks the conditions have been favourable for ellipses in Finland as it has been clear skies and around -15° C temperatures during the daytime, which is the optimal temperature for the elliptical halo crystal formation. In this case the temperature on the ground was -16° C, but the ellipse formed in an ice crystal layer that slightly above the ground. In Tampere similar crystal layer situation was observed as well, however, the halos were the usual stuff. A couple of days ago I made a post about the fake sun, showing the excellent photos of Julie Bronson and drawing by Giovanni Cassini. This reminded Mika Aho of his photos of similar looking effect that he took on 19 May 2008 in Korpilahti, Finland. The two photos are shown above and they were shot with an old cell phone camera, which explains the slightly less than optimal quality. 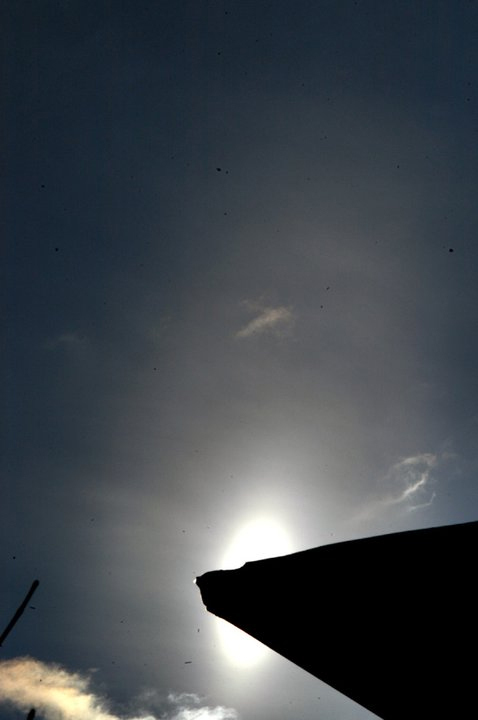 The sun is behind the edge of dark Stratocumulus cloud and the fake sun candidate is seen below the sun, with short and fainter extension of pillar further down. 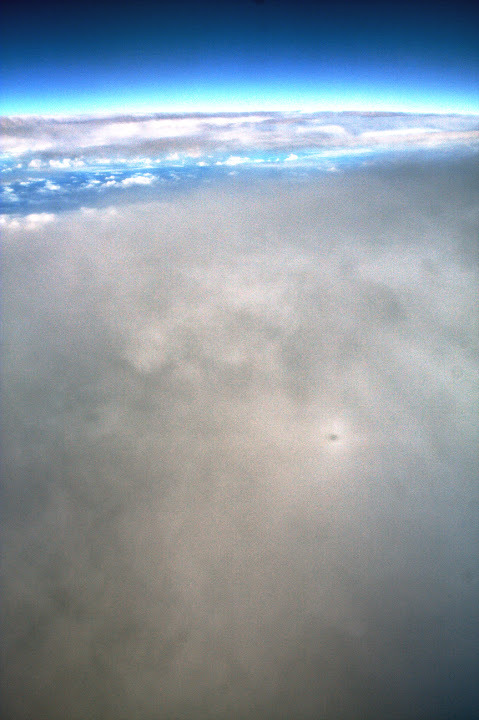 The crystal precipitation from the cloud is not visible. 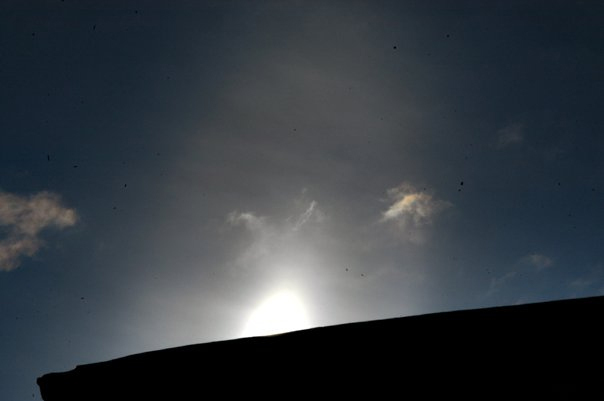 Now it looks like there may be a circular fake sun image of the sun under the cloud edge, but it is not very bright. The cloud edge is actually much brighter. By strict definition one could say that a genuine fake sun should be so bright that one would take it for a real sun, but of course there is a continuum of intensities, and putting an arbitrary line somewhere along the range is not very fruitful. So, with some reservations due to the images quality, I might say that probably we are looking here at a faint version of a fake sun. In any case it is good that people have started looking for this, be it old photos or fresh displays in the sky. 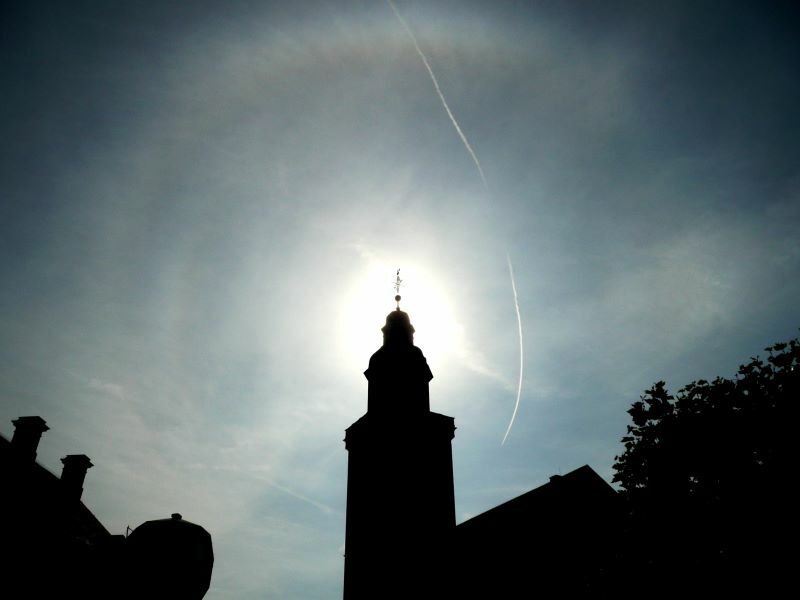 David Åsbrink took these photos of a diamond dust halo display in Stockholm on 8 December 2010. The phenomenon was noticed by many people. 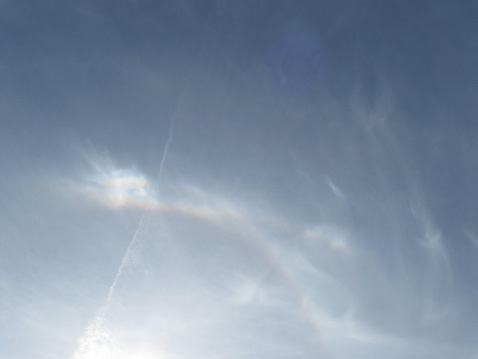 In addition to being a bright and beautiful display this one contains also a rarity: inside the 46° lateral arc there is a weak colored spot, the 44° parhelion. It is marked in the third image with an arrow. 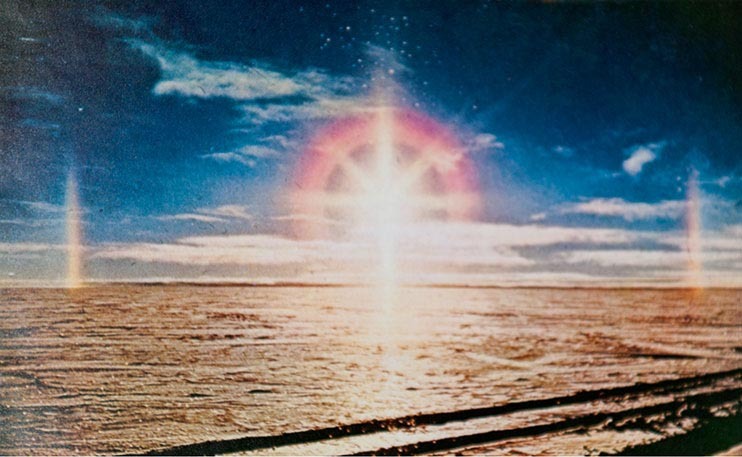 44° parhelia are the parhelia of very bright normal parhelia and they were photographed first in 1970 in Canada's Saskatoon. Since then about 13 more photographed cases have accumulated. These days it seems like we are getting at least one photographed case every winter. The solar elevation for these photos was 8 degrees. A handful of halo displays have been of such an impact that they have become known by the location of occurrence or by the observer’s name. The display in Canada’s Saskatoon on 3 December 1970 belongs in that group – it is simply called ‘the Saskatoon display’. 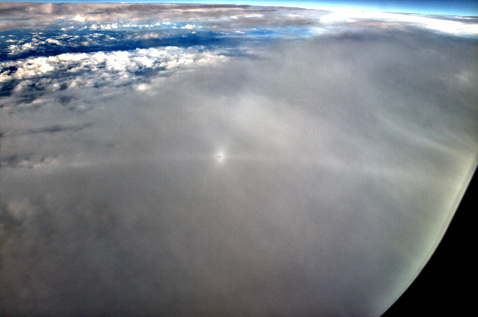 This halo complex was of remarkable intensity but its main merit is that it provided the first photographic documentation of parhelia at about 46 degrees distance from the sun. More precisely, they are 44° parhelia, which are the parhelia of exceedingly bright ordinary 22° parhelia. 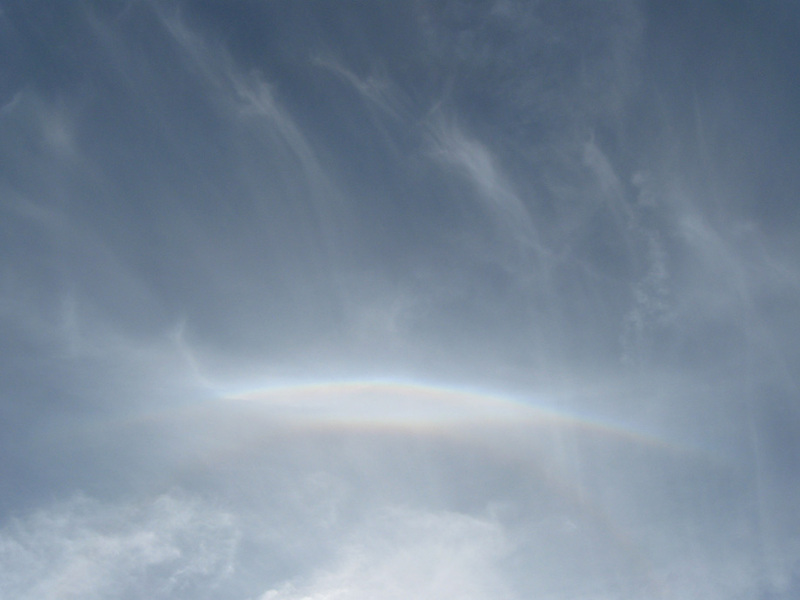 “Secondary halos” and “multiple scattering halos” are the terms that have been used to describe halos formed in such a way. 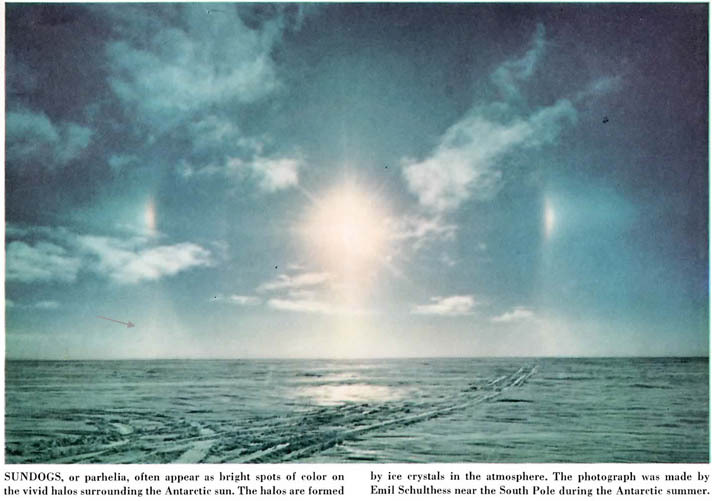 Thus far, only one photo of the display’s 44° parhelia has been published, printed in black and white in the June 1972 issue of Weather magazine in an article “Unusual arcs in the Saskatoon halo display” by W. F. J. Evans and R. A. R. Tricker. 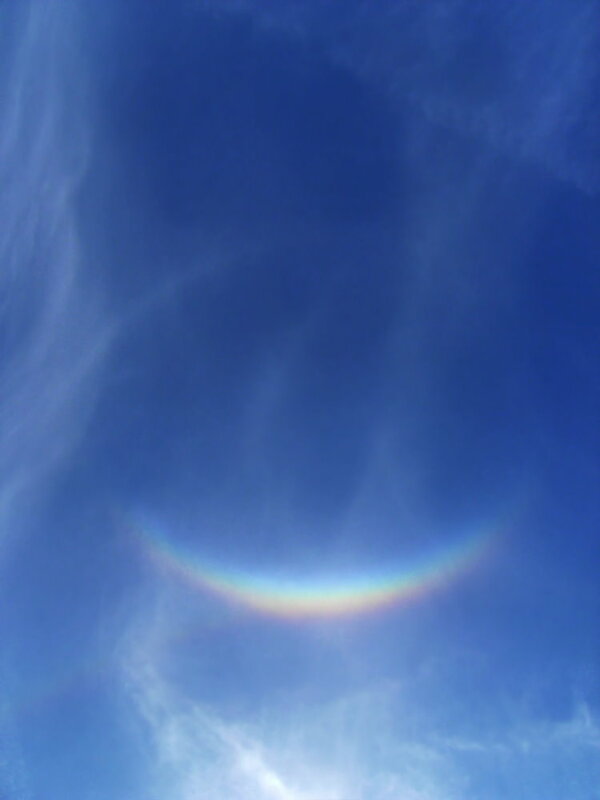 The cover of that issue is shown above, with a photo of the circumzenithal arc from the display. The cover was originally in color but I have only this black and white scan. Shown also is a drawing from another Weather article “Photometeors at Saskatoon on 3 December 1970″ in the 1971 issue 26 by Earle Ripley and Bernard Saugier. Of the few people who photographed the Saskatoon display, Earle Ripley was watching it at the University of Saskatchewan campus. 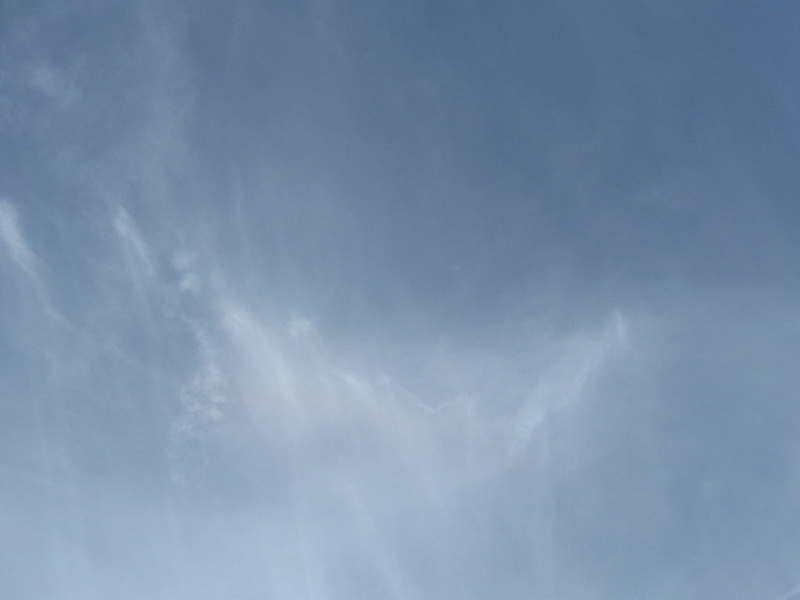 Above are two photos of the 44° parhelia that Earle send me a couple of days ago after I had contacted him. He gave permission to go ahead with publication on the internet. The photos were taken about 10:30 am, at which time the sun elevation was about 9 degrees. The intensity of the 44° parhelia in those photos is unparalleled. This is made even more remarkable because of the high sun elevation. 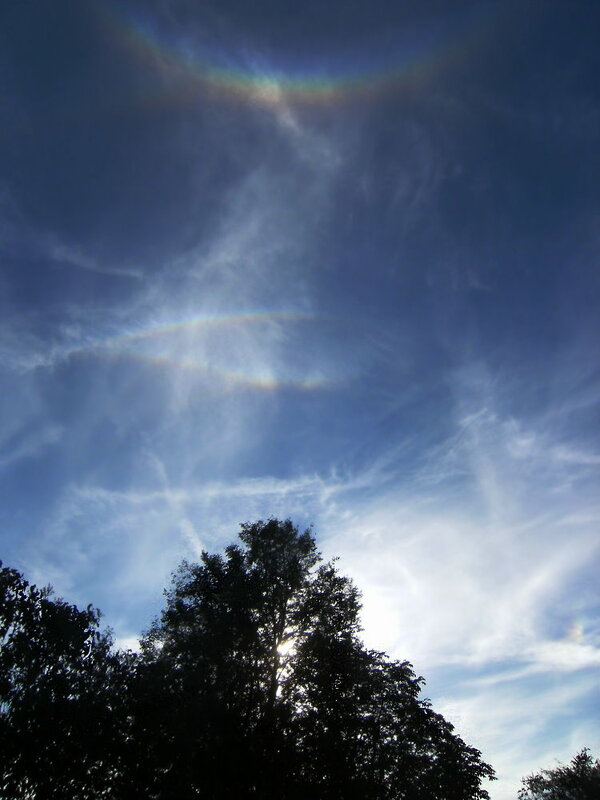 No other 44° parhelia photos exist for this high a solar altitude. The higher the sun is, the more extensive the diamond dust cloud has to be vertically in order to have enough crystal mass for the formation of the 44° parhelia. The horizontal extent of the diamond dust in 44° parhelia displays is probably always of the order of kilometres. After Saskatoon, 30 years passed until the next photos of 44° parhelia were taken. Now it appears that we get one photographed case every year. This year's display came from Sweden, last year from Czech Republic. None have been as great as the Saskatoon, but displays of similar magnitude and style certainly recur - at least in the vast uninhabited expanses of polar areas - and one day someone is bound to be around when that happens, hopefully with a camera. If there is a holy trinity for a halo man, it must be the appearance of streetlight pillar and Bottlinger's ring. The night we saw this with Jari Luomanen we had given alreaydy up the halo hunt at Sappee ski resort and were returning home. But on a way back Jari thought of seeing something resembling 22 tanget arcs in the Kangasala lights and we went to take closer look. It was not tanget arc - the lamp pillar was accompanied by a steep V-figure, of a kind which we had never seen before. We started photographing, although in the beginning we had swells of suspicions of it being just a lamp artefact. However, as the effect later clearly showed on some other lamps, this was not a worry anymore: it was a halo. But what halo, that was not competely clear until later when the halonight was already over. The stuff formed from nucleating water fog at -16 C. The area where the nucleation took place was perhaps about a square kilometer and within it, only at a small, say, two hundres square meter area was the Bottlinger seen. Elsewhere it was just pillars (the first photo above shows just pillars, but to the right from the photo a Bottlinger was seen constantly from a lamp only about 100 meters away). And outside that water fog was everywhere. Anyway, the Bottlinger was seen in the same spot for 4 hours at the Kangasal industrial area. We drove a bit around returning always to same place. Some variation can be seen in the photos in the angle of the V when a time lapse movie is made. I took crystal samples and above are plenty of photos of those crystals. For some reason all turned more or less blurry, but one can still make out details of them. Is it only me, or are the branches of many crystals slightly sloping towards the ends? That low angle would provide the reflecting surface for the Bottlinger in horizontal crystals. Now Bottlinger's ring is just a helic arc from crystal angles that do not deviate much from the horizontal, but in this display there was also another helic arc, as shown by two photos above. This one probably has the same angle as the normal helic arc from Parry crystals. Non-Parry helic arcs are common - they have been seen with only a pillar. I wish you all a very happy year 2011, may it be rich in halos and celestial wonders! I ran some simulation of halos created by hollow columns. 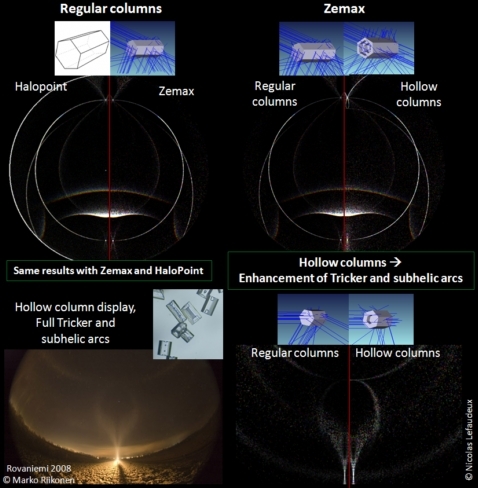 Usually, hollow columns are considered to be poor halo makers, reducing the probability of getting rare arcs. I have simulated hollow columns display using Zemax. Zemax is commercial software used for optical design. Its primary purpose is design and optimization of optical systems. It allows only static simulation, but I wrote a few macros to simulate halos. The main advantages are that you don’t need to compute yourself all the optics laws, just to concentrate on the halos, and it is very flexible software. I have been able to simulate displays from twinned and complex crystals. Its main disadvantage is that it is very slow compared to dedicated software like Halopoint. I have compared the two software and they give the same halos, so the optics inside is really the same. Crystals used to simulate hollow columns keep their crystalline faces for the hollow parts. In real crystals, the holes appear to be more rounded and smooth. The halos simulated are so from ideal hollow columns. 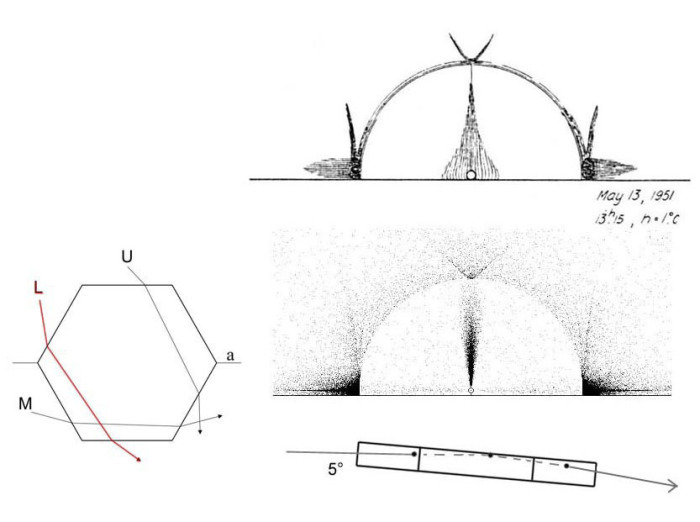 Simulation shows that, quite unexpectedly, hollow columns strongly enhance complex arcs in the anthelic direction. For instance, Tricker and subhelic arcs are much more prominent than with regular columns. Marko Riikonen pointed out a display with samples showing lots of hollow columns that had strong Tricker and subhelic arc. Simulations with hollow columns are quite consistent with the display. I still don’t really figure how these complex raypaths can have increased probability with hollow columns, but simulations definitely show it.